When an adult has cardiac related issues, there are numerous factors that may have been the cause. Heart disease, high cholesterol, obesity and high blood pressure, can all contribute to emergency cardiac incidents. In children and infants whose hearts are typically young and strong, a cardiac event is troubling because it is unexpected. Most cardiac arrests in the very young can be attributed to an alternate cause that is usually respiration related, like croup. Croup sounds awful. The seal bark cough (stridor) and wheezing, sets parents on high alert. It is an alarming medical event that causes anxiety and restlessness for infant and caregiver alike. 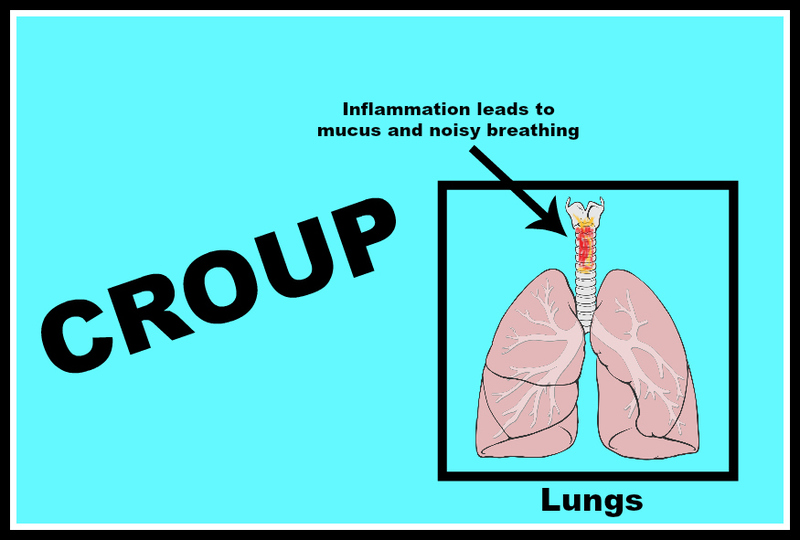 The medical name for croup is laryngotracheobronchitis and it occurs when the voice box (larynx), the windpipe (trachea), and the bronchi (pathways to the lungs) become inflamed. This inflammation causes the airway to partially swell, leading to the characteristic barking cough associated with croup. Predominently caused by the Parainfluenza virus, other viruses such as the respiratory syncytial virus, influenza, adenovirus and measles can also play a role in the development of croup. Prior to immunizations, croup was a daunting disease. Today this disorder is more mild, although it can on occasion develop potentially dangerous aspects. Typically croup hits children between the ages of three months to six years and while the virus is usually contracted one time only, reoccurrance can happen in some children that are prone to it, particularly boys. If croup combines with a bacterial infection, bacterial tracheitis (a rare but infectious upper airway obstruction) can develop that may evolve into epiglottitis. This dangerous combination will require a hospital stay with airway evaluation and intravenous antibiotics. There are no specific tests for diagnosing croup. The distinctive cough is usually sufficient enough for a diagnosis but doctors will always assess for breathing difficulties, poor oxygen intake and additional complications or causes. Being a virus, there is no treatment for croup directly. Antibiotics are only prescribed if croup presents alongside a bacterial infection. Severe cases may require hospitalization and treatments with IV fluids, humidified oxygen therapy and albuterol administered through a nebulizer to open the airways. In extremely severe cases with additional complications, maintaining the airway may be necessary. Croup is a contagious disease, so avoid exposure to the virus and keep an infected child at home. Keep the home smoke free and practice basic hygiene, particularly handwashing. Never hesitate to seek professional medical help if needed.